Mixed Metal Necklace Copper Bronze Silver Chain Green Stone Necklace Abstract Design Aventurine Gemstone Jewelry 19" Long Grecian Inspired. 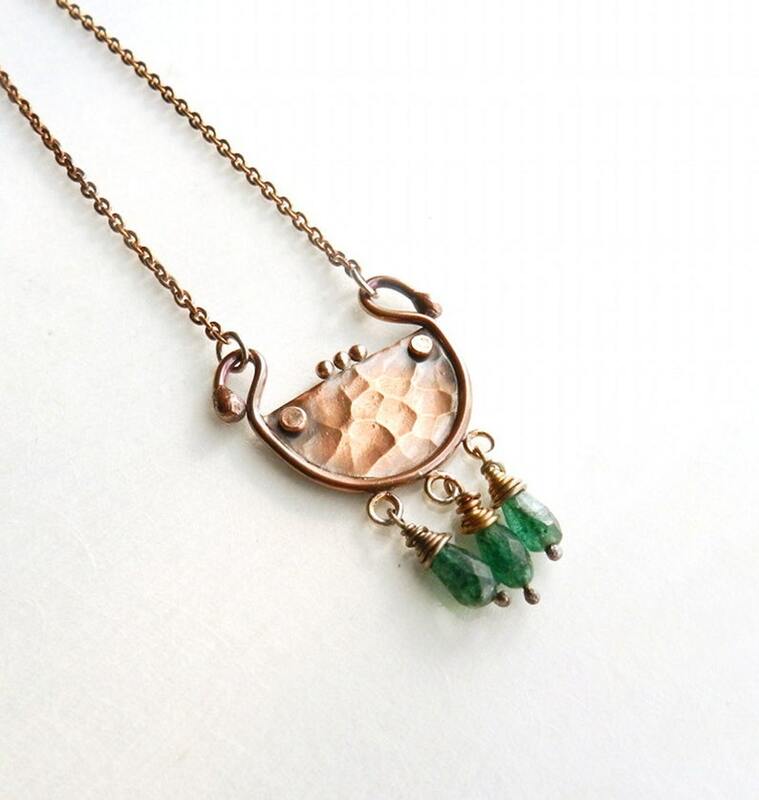 This pretty copper necklace is very feminine with round curves, green aventurine dangles, and bronze granule accents. I oxidized the pendant to a warm brown and paired it with natural aventurine drops that are roughly polished. It is 1” at the widest point and approximately 1 ½” long. The warm color of the copper and green of the stones beautifully complement each other. The chain, clasp and jump rings are sterling silver (all oxidized to match the copper), and the length of the necklace is a little over 19”. The design and fabrication process have been completed by me. Very pretty!! My girlfriend loved it! Thank you! Gorgeous! Picture says it all! Super fast shipping! I accept PayPal and other major credit card payments. Items must be paid for within 24 hours of purchase. If you are not 100% satisfied, please return the items within 30 days of the receipt in original condition, and I’d be happy to issue a refund. Please note: Shipping fees are not refundable and the return shipping costs are the responsibility of the buyer. Most items will be shipped within 48 hours (excluding weekends and holidays) of receiving payment unless otherwise noted on the item page. Within the US, all items are shipped via USPS first class or priority mail. Internationally, I ship via USPS First Class International. The buyer is responsible for any customs or duties on international shipment. Delivery time for international shipping is anywhere from 2 to 4 weeks depending on each country's postal operations and customs process. Please understand that once the parcel is shipped, I don't have control over how quickly it is delivered. Thank you for understanding.